Welcome to the Blue Den Ranch website. The Blue Den Ranch is a family operated business and way of life located in the foothills of Scio, Oregon. For over 50 years, we have provided live rainbow trout for private pond stocking and many other events. We are members of the National Aquaculture Association, the United States Trout Farmers' Association, and the Oregon Aquaculture Association. 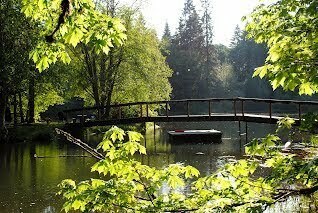 Our ponds are part of the Oregon Fishing Club network. We believe that preservation of nature's beauty can coexist with responsible and profitable business activity. The key is stewardship, leaving your world better than you found it, and lots of hard work. In the words of our founder, Ron Bentz, "When all the other farmers have gone home, hoe one more row."